Happy New Year! Time again for our annual 'Best Of' Soca radio show. Alot has happened for 2017 and each of the crew weighs in on their picks for the best in the genre from the entire year. We debate the Best Groovy Song, Best Power Song, Best Riddim, Best Artist, Song of the year and more. 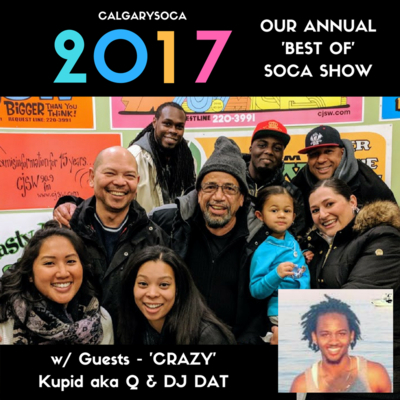 This year we're joined in studio by the Calypso Legend 'Crazy', special guest Kupid aka Q from Orlando, and DJ DAT joins us over the phone from Bermuda. After the recap, Uncle 'Crazy' ends the show with one of his latest releases for 2018. Enjoy! Drew - Freezy, Nailah Blackman, Marzville, Motto, Turner, *Skorch Bun It.